Authenticity is a big buzzword in business these days. From consumers expecting more of it in the brands they buy and companies they frequent, to the push toward a leadership style that chips at some of the constructs we have around being the boss. But leading authentically isn’t just a fad, and it’s brought success to a number of companies over the years. Take for instance Ford CEO Alan Mulally, who took over the then-flailing company in 2006 and brought his folksy, down-to-earth personality fully into the mix when he made it a practice to engage with employees in the factory. By scrapping the formalities that made past executives unreachable to the lower tier employees who were the backbone of the company, he inspired trust in his employees and got them behind him when he made some difficult choices that put the company back on the path to success again. You may be thinking of the exceptions to this story – Steve Jobs, Jack Welch, Richard Branson – but all of these examples are just exceptions. Consider this – go to the list of the CEO’s of the Fortune 100 companies and see how many you know. 3? 5? maybe 12? Probably not many more. And yet these are the people who are trusted to lead the world’s largest revenue companies, which in turn means that they are the companies where customers spend the most money and therefore have the highest consumer trust, rooted in the trust that the company has in its leadership. Admit you’re imperfect just like everyone else, and ask for help when you need it. Own your mistakes and learn from them, instead of brushing them aside or refusing to acknowledge them out of shame or a misplaced sense of pride. Be purposeful in everything you do. Every action you take and decision you make must in some way feed your larger business goals. Don’t do something you know isn’t right for your business simply because you know five other founders who are doing it. Care about your people and show it. Get to know the people you work with and give them the opportunity to get to know you. Make a genuine investment in their growth, not just the growth of your brand or product. Trust and be trustworthy. Authenticity breeds trust, but also requires the same in return. Entrust your employees with hard problems and be transparent about where the company is and the challenges you face. The more included they feel, the more invested they’ll be. Know yourself and what that means for who you will be as a leader. The first step to becoming an authentic leader is ensuring you’re self-aware. You must understand your tendencies, fears, and strengths, as well as what you may unknowingly be projecting to others. 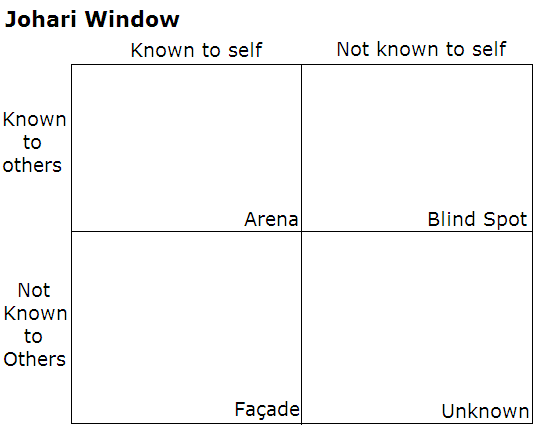 One of my favorite tools for this is the Johari Window model. It’s a collaborative awareness exercise that helps individuals and groups understand themselves and each other. Here’s a quick exercise you can do to learn some of what is in each section: Choose a handful of adjectives that you think describe you from a large list (50-100), then ask your team to each choose a handful of adjectives they feel describe you. The ones that both you and your team members selected are your “Open Self” which is the part of you that is known to both you and others. The words only you chose for yourself describe your “Hidden Self”, which is known to you but not others. Those adjectives only your team chose indicate your “Blind Spot” or “Blind Area”, aspects of your personality that are known to others but not to you. These adjectives are just one perspective in seeing your opportunities to have a more open self. Recognize when there are aspects of yourself that you don’t share at work – a secret talent or hobby that displays more of who you are. Further, find opportunities to seek feedback that allows you to learn more about your blind spots of various skills of communication, strategy, or specific roles you fulfill. The goal then is to maximize your Open Self and operate more from that place. By being aware of what’s in your Blind Spot, you can start to own and integrate those characteristics into your Open Self and leadership style. This is particularly relevant for strengths, but also applies to weaknesses. Owning up to your weaknesses is an impressive aspect of leadership – it allows you to complement your strengths with people who can mitigate your weaknesses, while also making you a more approachable and humble leader. The “larger than life” leaders tend not to be ones who have a strong company culture. Other frameworks for gaining self-awareness are the Enneagram and the OCEAN (Big Five) Personality Quiz. The Enneagram categorizes people into 9 types, each with its own core strengths and areas of development. There are a number of online Enneagram tests, but I prefer this one. The OCEAN Personality Quiz looks at how prominent each of the following traits is in your personality: Openness, Conscientiousness, Extraversion, Agreeableness and Neuroticism. While these and other frameworks can give you good insights into your personality as a leader and beyond, I don’t recommend putting all of your eggs in those baskets. If the results seem way off (and not just because you might not like what they indicate), then trust your own instincts and what those who know you best in a work environment have to say, above what an online test indicates. Remember: the goal is to understand yourself and maximize your openness and authenticity, not to throw yourself into an existential crisis. Let go of your ego. As I discussed at length in my post on giving and receiving feedback, it’s hard to face criticism. When you’re in a leadership role, there may be a component of ego that makes it even more difficult. You might think “But I’m the boss, I’m in charge, obviously I know what I’m doing. If they know so much, why aren’t they the ones running the business?” Get all of that out and then let it go. Instead, remember that you are human and flawed, like everyone else. And keep your eye on the goal: becoming a great leader so that your startup is a place where creativity and productivity can thrive. Understand that everyone who works with you has that common goal, and the more open you are, the more easily you can focus on that goal. You can’t do it alone – you need great people working with you – and great people want to work somewhere that they feel valued and comfortable. See growth as a gift. Even though it’s painful, the ability to grow is crucial to succeeding as an entrepreneur. Some people don’t get many opportunities for growth, because they’re never challenged to develop the awareness that facilitates it. They simply do their jobs well enough and ascend to leadership positions within companies largely because those companies promote from within. Plus, not all companies nurture their leaders or ask their leaders to be self-aware and authentic. Some just ask leaders to take charge and assume responsibilities, but downplay the human side, to the detriment of everyone and the company at large. Whenever you have an opportunity for growth, take it. Realize that you and your team are better off if you are all aware and understanding of each other’s strengths and weaknesses, and can help each other blossom in the right ways. Focus on the positives, but address the negatives. Even though you may have discovered you have some characteristics you aren’t happy about (and maybe don’t agree with), it’s likely you also found or confirmed some positive ones as well. Don’t dismiss the negatives, but approach them from the point of the positives. Say you’re aware that you’re intelligent and knowledgeable, but also nervous and self-conscious. You can build confidence and quiet some of your nervousness and self-consciousness by remembering that your knowledge and intelligence — as well as your openness to feedback — facilitate good decision-making. Everyone has their areas for development, and while it’s much easier to focus on these, they are not what got you to where you are. Ground yourself in your strengths. Realize that it’s the things you’re inherently good at, not the things you falter on, that are going to propel you into success. Your weaknesses can be your downfall if you are not aware of them or you do nothing to keep them in check. However, spending all your time trying to turn weaknesses into strengths is not going to make you more successful. It’s not about knowing yourself so that you can change yourself entirely, but about guarding against those unseen parts of yourself taking over and running amock. Own the bad stuff. I know I already touched on this, but it’s important enough to re-emphasize. Many leaders become unapproachable when their team sees them as an infallible entity, making the team afraid to speak up or take risks less they be be exposed for their imperfections. Leaders can counteract this potential by owning up to mistakes and blemishes in their history. I’m open with my team and students that I have been fired from jobs and was in the lower portion of my class in college. Otherwise, they just see my resume and think they could never live up to my standards. Telling them my stories allows them to see me as human – helping them realize that I will be honest with them and will work with them through challenges. Being an authentic leader isn’t a specific type of leader – it’s being you – all of it. The quirky, stumbling, accomplished, and human you.